I should be typing the word FINISHED in capital letters as it's about time. I started on June 29th, 2010 - almost four years ago. I do have an excuse for part of the delay. The knitting got set aside when I moved from Denver to Calgary. My other excuse is that, when I put it away, I had the colorful yoke finished and all that remained was the hundreds of black stitches. I call them excuses, but the real reason is that other projects came along and I only thought of the Bohus occasionally. Actually, this sweater has been an absolute joy to knit. I love the pattern, the yarns are soooo nice and, best yet, I was knitting along with friends. A group of us would get together at a room at the Centennial, CO library and work on our sweaters. We were the "Bo-hussies"! 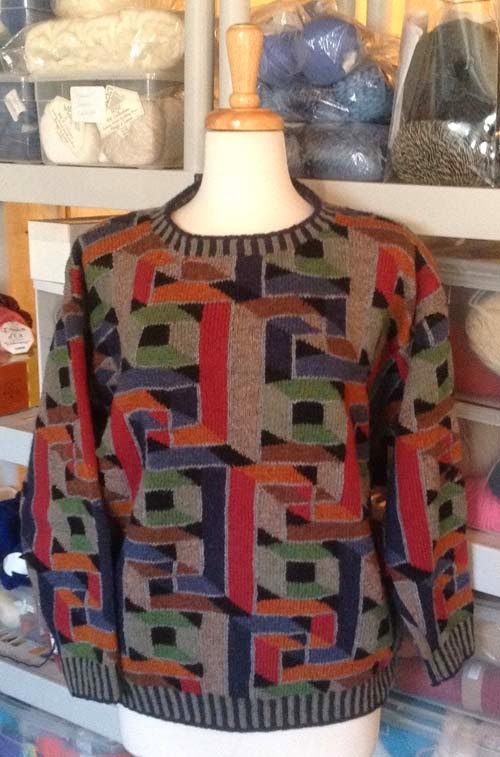 There was the friendship and the chance to see other Bohus sweaters in person. Some have finished their sweaters, other are still in progress but I'm hoping that I'll get to see them in July. (Corner Baker, ladies, see you then....bring your show-and-tell! I'm challenging you to finish if you haven't already done so.) One day I would really like to make another Bohus, possibly a cardigan next time. Yarn: Bohus 50% Angora - 50% Merino Yarn laceweight from SOLsilke. There are many colors, more than what you see at first glance. edited to add: I've just learned that the kits are no longer available and that the yarn is discontinued. After years of the kits being put together it's very sad that this is no longer the case. A Bohus can be made with other yarn but there was something special about using the original, given the rich history of Bohus knitting. It seems that it's the end of an era. If I'd known it was coming I would have stashed a couple more kits for future knitting. Modification: I changed the purl stitches in the yoke to all knit, preferring the smoother look. Otherwise, I followed the pattern as written. Bohus Background resources: If you like the Bohus sweaters you would likely enjoy the video that chronicles the history of these very special garments. An excellent book is Poems in Color by Wendy Keele. Some of the history of Bohus knitting can be found here. Bohus knitting is included in Knitting In the Old Way by Pricilla Gibson-Roberts. 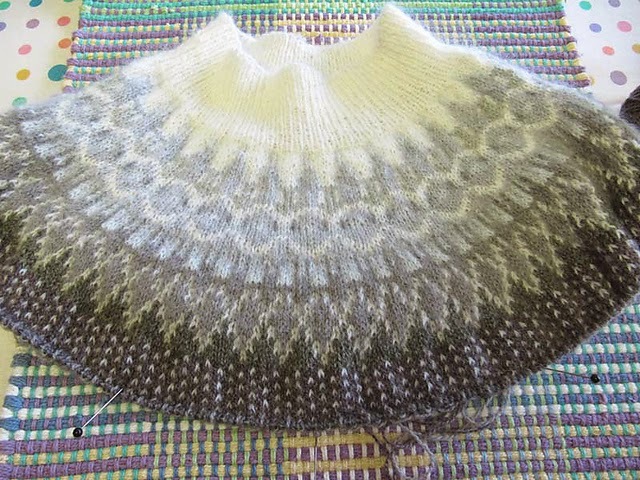 There are many fine Bohus-inspired designs and lovely yarns available. One is Kimmet Croft Fiber..
As I mentioned in my last blog post, I've started a project that will put a bit of a dent in my stash. It's the knitalong project from ROWAN Yarns, an afghan designed by MARTIN Storey....hence, the name! The afghan is made up of 48 blocks plus the trim and calls for Rowan's new superwash worsted wool. Each clue/square is knitted 6 times and there are 8 clues, plus a trim. I'm not using the suggested Rowan yarn as I've made a promise to myself to knit from my stash as much as I possibly can. For this project, I can. 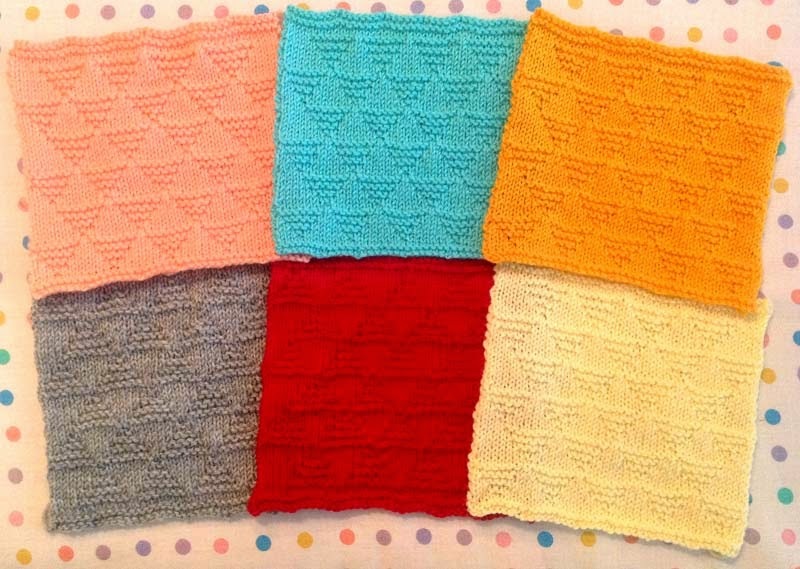 Dig deep into my stash and make every square in a different color. It doesn't matter to me if it looks like the colors may not all go together. I'm thinking that it could be like a large group of singers. Maybe not all can sing well, but when you put all of them together, you get music. So, for my first clue I just pulled out the first six colors that I put my hand on. Although I haven't checked yet, I think that I'll have no problem coming up with 48 different colors. If I really dislike any of the blocks when all are complete, I can always reknit in a different shade. If it looks like I might be running out of new colors and I've only knitted about half of the squares, then I'll start duplicating colors, having two of each color. If I start running out of colors but I'm getting close to the 48-square mark, then I'll finish up with some squares in semi-solid or slightly variegated colors. I plan to make the trim (Rowan calls it "trim", and I'm wondering if that's different from a border) in one of the lighter shades. I understand that there is cabling in the trim and I want to be sure that it shows up well. So, the first clue is completed and I have my six blocks. Clues are published every Monday and the next one will be on the Rowan website on April 28th. 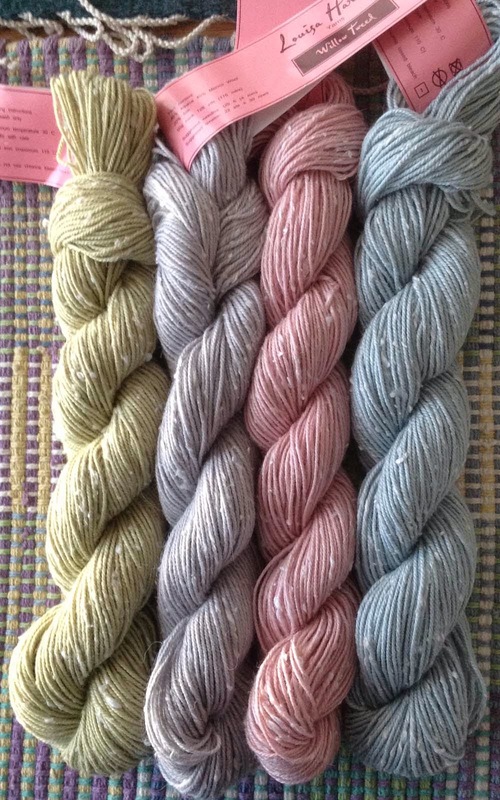 I have some dyes and natural yarn in my stash - I could dye some colors if needed. After thinking of every possible yarn combination, getting input from friends and browsing through my stash I've finally made a decision on the color combination of Tutti Frutti. This is the same yarn as in the rest of the sweater, Louisa Harding Willow Tweed. This is color #01 - Natural. Now, if I'd had this yarn in my stash to begin with there would have been no problem with deciding. The first decision I made was to use an off-white color for the minor stripes. White would have been too stark a contrast (I agree with you Barb B). I thought of medium-colored stripes but I liked the idea of keeping the entire project in a lighter color combination. I shopped my stash and did find some off-white in a DK weight but it looked heavier than the Louisa Harding yarn. I've been doing gauge swatches and the yarn seems closer to a sport weight. Using the same yarn will ensure that the weight of the yarn is consistent. So, the decision was made to buy yarn even though I'm planning to use the yarns I have in my stash for the foreseeable future. The color is right, the weight is right and I won't need much since it's a small part of the design. The yarn is discontinued and in short supply, especially in this shade and I wasn't seeing it anywhere. Then, I thought of eBay and found what I needed. In the meantime, I have plenty of other projects on the needles and in the offing. Next time I'll tell you about the stash-busting project I've just started. We now take a break from your regular blog reporting to bring you this weather forecast. For those of you unfamiliar with the Celsius temperature scale, 0°C is 32°F and +1°C is about 34°F. This clip is from the TV show "Rick Mercer Reports", a comedy show in Canada. Knitters, check oot the nice sweaters. Rick's is a Cowichan-inspired design. Has anyone else had enough of winter weather (if you're in the Northern Hemisphere, of course)? Ignore the plastic headband! This pattern and the picture are from 1981. I won't be looking for that accessory to wear with the sweater. I won't be adding the shoulder pads either. I'm struggling to get started. I'm going to use Louisa Harding Willow Tweed as I have enough in my stash. 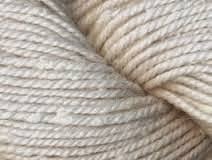 It's a blend of alpaca (40%) and merino wool (40%) with little puffs of white silk (20%). The yarn is now discontinued. The original sweater is done in a yarn that knits to a worsted or aran weight. I wanted to do a more lightweight version. The yarn I have claims to be a DK weight but it looks thinner to me. I did a gauge swatch on 4mm/US 6 needles but the resulting fabric was much too loose. The same was true for the 3.75mm/US 5 needles. Now, I'm going to do another swatch, going down another needle size. Once I've found a gauge that I like, then I'll make adjustments to the sweater. I'll probably end up doing more stripes at this finer gauge but that's fine with me. My next issue is trying to decide on the placement of the stripes. I have 6 skeins each of green, pink and aqua - as well as 4 skeins of light gray, so there's enough for almost any striping option. In the photo to the right the sun is shining on the green making it appear a little brighter than it is, but still, it's close to the true color. The pattern's picture, above, shows 4 colors for the major stripes and a 5th color, the black, for the minor stripes. use all 4 of my colors for the major stripes? If so, what color would work for the minor ones? If I don't have it in my stash, I don't mind buying a single skein or two if necessary. Since this yarn is discontinued and hard to find I don't mind doing the dividing stripes in another type of yarn. Would white be too stark? use 3 of my colors for the major stripes and the fourth for the minor one? If so, which ones should I use? I thought of using the green for a minor stripe, laid it out on the table and didn't like it at all. use all of my colors or should any one or more of them be set aside for a different project? what order would look good for the striping? I haven't decided if I'll add the zipper to the front. If I do, it should probably match the color of the minor stripes - so I'd need to be able to find a suitable zipper. I doubt I'll make the little filler piece in the center, between the sides of the zipper. If I don't use a zipper I'm thinking that I might make a V-neck sweater instead...but that decision is one of the last ones I'll make. Color and needle size are my first priorities. I'll continue to think about this...swatching and laying out the colors in different combinations. I welcome any and all input. Meanwhile, my other project, Mosaic, is coming along nicely, approaching the halfway mark. The back and one sleeve is finished. I'm starting a new category on my blog called "I Had To Share". Often, when surfing the web, I find the most interesting blog posts, sites, projects, opinions, etc. and they are too good to keep to myself. This week's fun find is about pompoms. Now, I've made a pom pom or two in my life. Mostly they've been made to dress up the top of a little girl's hat or at the end of the ties for the hat. They are nothing compared to the ones you'll see in this post at Lost In Knit. Included in the comments is a link to making some of the pompoms. I'm probably not going to be making any pompoms in the foreseeable future (but never say never!) 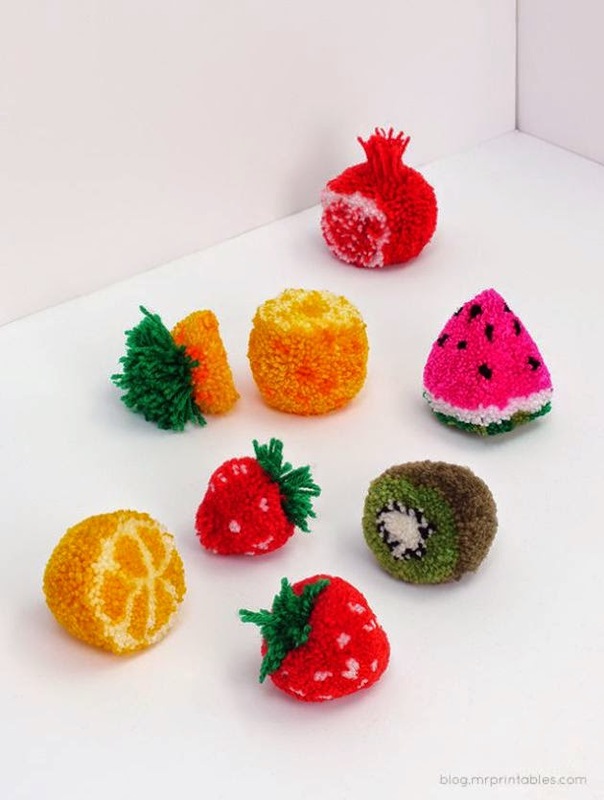 but I really admire the creativity and artistry of the pompoms in this blog post.